WARNING: If you hate blood, don’t watch this video. A Russian dancer has taken dancing to the extreme, smashing her face and breaking her nose while auditioning for So You Think You Can Dance. Ekaterina Kondrashina was nailing her performance on the Russian version of the reality television show until she launched into a split causing her head to smack the ground. Like a true performer, Ekaterina continued with the rest of her routine before rushing offstage to get medical attention. It’s not known if she made it through to the next round. A teenage girl’s father is reminding her boyfriend about who’s boss in a hilarious way. Ricarra Schock and her boyfriend were posing for pre-homecoming photos outside the family’s Wisconsin home when her dad Benjamin decided he wanted to re-create the image to ‘prove a point’. 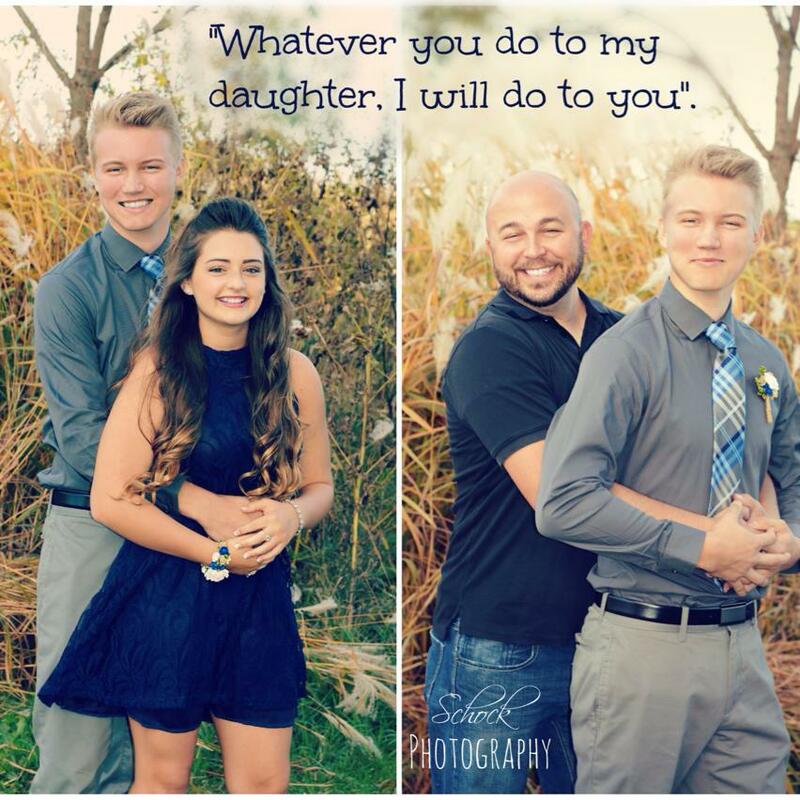 The father pushed aside his 15-year-old daughter and imitated the couple’s pose. The photograph has since gone viral with more than three million views. Dumping the Queen for a Dame (Edna, that is), and The Wiggles over Banjo Patterson, a Melbourne artist is re-imagining the Australian currency. The self dubbed “Straya Cash” is an intiative by Aaron Tyler, who says that modern Australia needs a modern currency. He believes that the notes classic images, for instance convict businesswoman Mary Reibey on the $20 note, are irrelevant to modern Australians. Instead, he advocates for Australian icons such as Alf from Home and Away, party boy Corey Worthington, and the nice, different, and unusual, inclusion of Kath and Kim. Time will tell if the people of Australia support Tyler in his quest to create “Straya Cash”. You can now bathe under the one and only Darth Vader and R2D2. The new shower heads have been released by Bed Bath and Beyond in light of the release of the new Star Wars film, Star Wars: Episode VII – The Force Awakens. The film is due to be released on Decemeber 18, however those who want their Star Wars fix can purchase the unique shower heads now. HAVE you ever wondered what it would be like if parents spoke to their friends the same way they speak to their children? Turns out it’s pretty hilarious, with the ladies from The BreakWomb giving us an amusing demonstraiton. In their newest video, titled: ‘If Moms talked to each other the way they talk to their kids” the three women can be seen having an adult conversation in ‘parent-to-kid’ style, which involves scolding and major praise for tiny accomplishments.